A celtic folk/black metal from France. The band was born in 1995 further to a concept elaborated by Aed Morban (drums). The first solid band line-up took form with Yoltar (vocals and keyboards), Fir Doirtche and Brennus (guitars and choirs). A period of intensive song-writing then began, pronounced by metal and Celtic music. 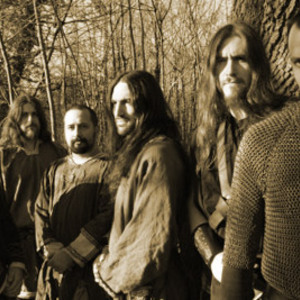 The arrival of Taliesin (bass) and Amorgen (whistles) in 1998 completed the line-up and enabled the band to get rid of the keyboards, replaced by more authentic sonorities thus reinforcing the BRAN BARR's musical reasoning. The debut album, "Les Chroniques de Naerg", was self-released in April 2000. It presented a music combining extreme metal with acoustic and folkloric sonorities. BRAN BARR developed there the Celtic dimension with the addition of war pipes, French bombarde and bodhran to its instrumental palette. Inspired by a novel by Aed Morban, the lyrics were the reflection of a fantasy world emerged from the mythology of the pre-Christian Celtic era. In late 2000, the band had to find a new guitar player to replace Brennus who quitted for personal reasons... That is how Nesh Keltorn joined the band in November 2000. During 2001, BRAN BARR took part to concerts and pagan metal festivals. Towards the end of the year, bassist Taliesin decided to part ways with the band. She was instantly replaced by Hades. BRAN BARR then incurred a long period of inactivity, due to side projects and various issues to be dealt with. In 2003, BRAN BARR was reinforced by the arrival of Kraban on whistles. Fir Doirtche decided to leave the band in January 2005 and was replaced by Llyr. In June 2005, BRAN BARR entered the studio to start the recording of its second album ?Sidh?. Amorgen left the band shortly after. Until mid-2006, the band played several concerts in Germany, France and Holland and took part in the Cernunnos Pagan Fest in December 2007. In 2008, Ah?s joined on violin and the band got in touch with a couple of record labels without getting a suitable deal. BRAN BARR finally signed with German label TROLLZORN in October 2009 and published the album "Sidh" in 2010.